Last week I was on time for work every day, which means I receive a $50 credit through my job's incentive program towards the purchase of anything I want! I must say that it has been a rough couple of weeks! For the most part I arrived on time, but it was extremely hard to do this for a full week. I would end up arriving at 8:03am on a single day out of the week and lose out on my credit. It seems as if I leave my house earlier every day, but arrive at the same time. The thing is, there has been serious traffic issues on almost every highway and bridge. Although I have several different routes to take, I always wind up taking the one that has the most traffic. Anyway, I need some help with deciding what to get. I've had my eye on DV by Dolce Vita's Maree Flat for months now. I want both colors, but I will have to settle for just one. Which color would you choose? * I also know where to get these for $39.99 with free shipping (I've already shared this site with some of you), but I went to make sure all goes smoothly with my order before I post about this retailer. 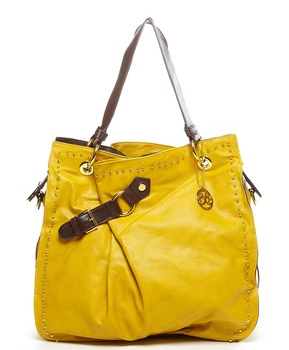 Another item I've been eyeing for a while is the Yulia bag from Sole Society. The bag is sold out in two colors, but fortunately I am interested in the yellow and lavender which are both still available. Again I can't decide between color - which would you get? I have a $59.95 credit at Sole Society, so technically I can have my bosses purchase the flats and then add the leftover $10 to my Sole Society order to get both of these items without $1 coming out of my pocket. I also really love the LC by Lauren Conrad dress below. Unfortunately, I waited too long and my size is no longer available, but I did find a few other items from her line at Kohl's that I love! I really want to get an iPad through this program. However, the first few credits I receive I'd like to get shoes, clothes, and accessories with. Since I have really been struggling with money the past few months and I need stuff I thought it was a good idea to take advantage of getting some items that I want and need. I figured it will get easier for me to get in on time the longer I adjust (therefore more credits). On top of that, I can use the iPad as some serious motivation to get to work on time every day! What would you get it you could only spend $50? Should I get the flats, a bag, or some clothes from LC's line? Or should I start "banking up" my credits for larger priced items now?